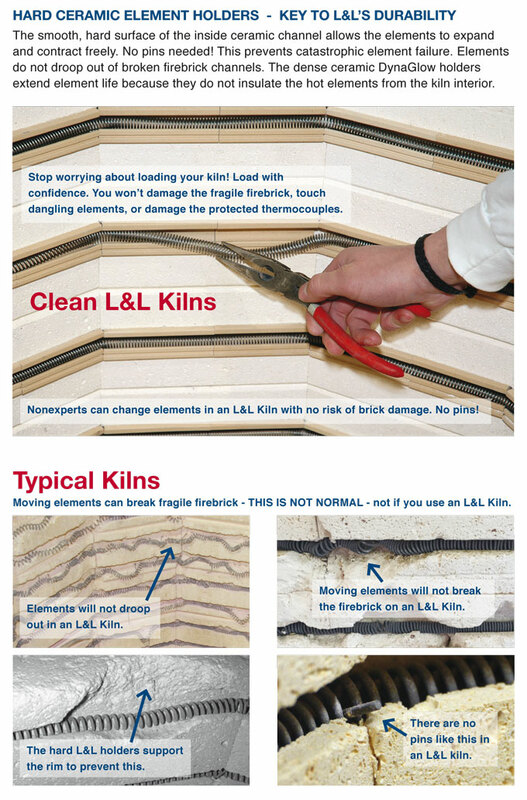 Kiln Facts: Why choose an L&L Kiln? Changing elements in an L&L Kiln with hard ceramic element holders is easy - and one reason L&L Kilns last so long. L&L kilns are the most "industrialized" kilns in the "hobby-kiln" class. They last for decades. Take a look at some of our top-rated features like hard ceramic element holders, ceramic protection tubes, super-strong stands, spring hinge systems, arched roofs in front-loading kilns and on and on. We back this up with a three-year limited warranty and, for our School-Master K12 kilns, a five-year limited warranty. Everything in an L&L kiln is logical. We think ahead and try to anticipate the problems you will encounter. That has been our tradition since L&L was started. We engineer serviceability into every kiln. Control panels are easy to open and service. Our unique hard ceramic element holders and ceramic terminal boards make changing elements something that anyone can do. Take a look at the extensive help available on this web site. Look at some videos and a few Knowledgebase articles. We are invested in service. We offer many different types of kilns and options so you can get exactly the right kiln for you. We charge a little more because of all we put into our kilns. For that you will get a kiln that will last substantially longer and does the job you bought it to do. It's about value. See what some incredible ceramic artists and other L&L Kilns users to have to say about L&L. Find out more about L&L Kiln Mfg Inc.